Welcome to the Department of Criminal Justice! 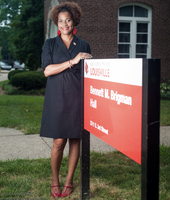 As the Department Chair and proud alumna (c/o 2001), I am excited to commemorate our upcoming 50th Anniversary. Since 1969, our Department has prepared thousands of criminal justice practitioners. We are one of the oldest Criminal Justice (formerly Justice Administration) programs in the country. As part of the College of Art and Sciences, we offer a Bachelor of Science, Master of Science and a Doctor of Philosophy in Criminal Justice. Located in the historic Bennet M. Brigman Hall, our department is comprised of award winning faculty who are student-centered, research-oriented and engaged in our community. Our academic programming meets the needs of 21st century students. We offer both our Bachelor’s and Master’s degrees online as well on campus. Our curricula consist of core courses that will prepare students for careers in criminal justice while offering specialized electives to understand contemporary justice issues. The doctoral program, which began in 2012, continues to produce the next generation of well-rounded scholars who excel in both teaching and research. We also have two criminal justice organizations – Lambda Alpha Epsilon and Alpha Phi Sigma – supported by student support staff who work to keep students engaged academically and prepared professionally. As such, we continue to have a thriving alumni network comprised of professionals employed at and leading agencies at the local, state, federal and international level. In addition to our degree programs, the Department houses the Southern Police Institute (SPI). Established in 1951, SPI continues to provide high quality training and educational programs for law enforcement professionals. SPI’s Administrative Officers Course (AOC) is a leading management program providing law enforcement education at the bachelor’s and master’s levels. SPI also has a strong Continuing Education component offering training on areas such as: homicide investigation, intelligence-led policing, and managing the media in law enforcement. To celebrate this golden anniversary, we are enlisting a host of students, faculty, staff, alumni and community members committed to offering a series of events in honor of our five decades of offering top-notch academic programs. We invite you to join us as we celebrate this momentous occasion throughout the next year. Please explore our website, note our important dates, peruse our faculty research agendas, join our student organizations and don’t forget to follow us on social media! We hope you will choose to join our legacy of criminal justice professionals and educators as you pursue your academic and career goals!